The Highland County Board of Commissioners recently endorsed the 2018 Highland County Women’s Hall of Fame inductees. Being inducted this year are Nancy Baldwin, Luise Curtis and Rosemary Ryan. Pictured are county commissioners and hall of fame committee members, from left, Gary Abernathy, Sue Smith, Jeff Duncan, Sharon Hughes, Virginia Purdy and Terry Britton. https://www.timesgazette.com/wp-content/uploads/sites/33/2018/08/web1_Commish-pic.jpgThe Highland County Board of Commissioners recently endorsed the 2018 Highland County Women’s Hall of Fame inductees. Being inducted this year are Nancy Baldwin, Luise Curtis and Rosemary Ryan. 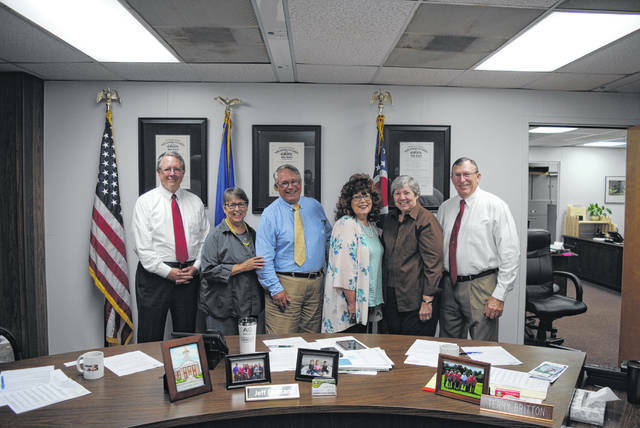 Pictured are county commissioners and hall of fame committee members, from left, Gary Abernathy, Sue Smith, Jeff Duncan, Sharon Hughes, Virginia Purdy and Terry Britton.